NFL defensive tackle who was selected 21st overall in the 2004 NFL Draft by the New England Patriots. He was selected to four straight Pro Bowls from 2009 to 2012 and helped the Patriots win Super Bowls XXXIX and XLIX. In 2015, he signed with the Houston Texans. He attended the University of Miami, where he played football and was named to the All-Big East Conference. He recorded his first two NFL interceptions in 2011, returning one for his first career defensive touchdown. 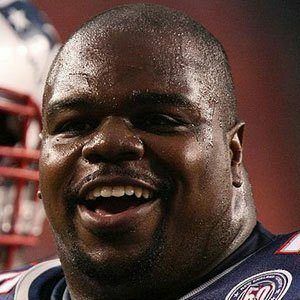 Has three children with his wife Bianca Wilfork. He and Tom Brady helped the Patriots win Super Bowl XXXIX over the Eagles 24 - 21.